This year was a particularly good one for the cockpit branch of the boat farm. I harvested lots of fresh greens (by boat standards), and had quite a bit of fun while doing it. The cabin side of the farm operation wasn’t quite so exuberant, and alas, I mostly forgot to take pictures of that group. This was because I was so busy focusing on the cockpit activity, since the outdoor plants were the ones I had pretty much forgotten to record in 2013. 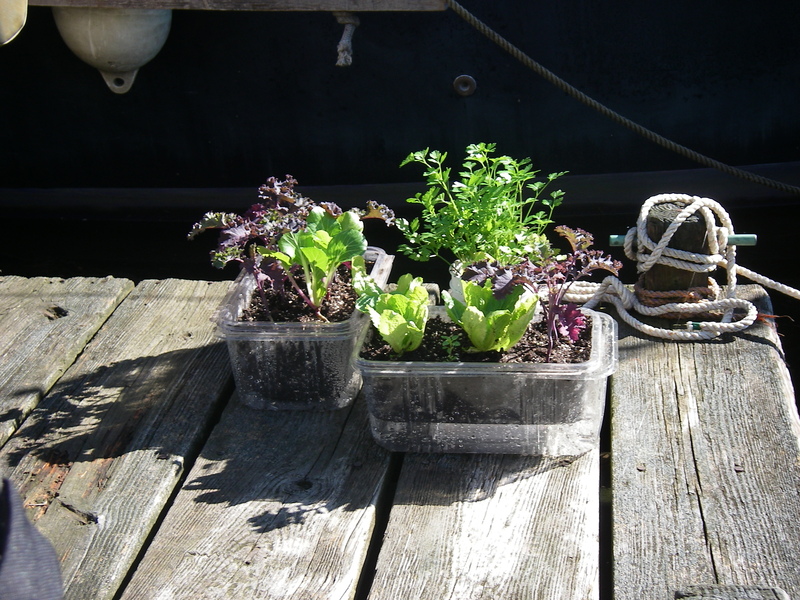 This is thanks to Suzanne, who had found the baby seedlings at the co-op and put them into these containers. Ordinarily we have focused on lettuce, but being the beginning of September when we started this, there were no organic lettuce plants to be had. Instead there was kale, pak choy, and Chinese cabbage. As it turned out, this was great – they grew like crazy, perfectly content in the cool and sometimes wet fall weather, seemingly having no problem at all with the short days. One of the most important things for this container gardening arrangement is the soil mix. When you get it right, the plants are both vibrant and productive. This goes on for a surprising amount of time, through substantial harvesting. The soil for this year included potting mix, lots of worm castings, 2 kinds of compost, “moo-do” composted cow manure, dolomite lime (this kind of lime adds minerals without changing the pH), and some powdered organic fertilizer, with special emphasis on the worm castings. Worm castings, like all the rest of the ingredients, came in a bag from the garden store. 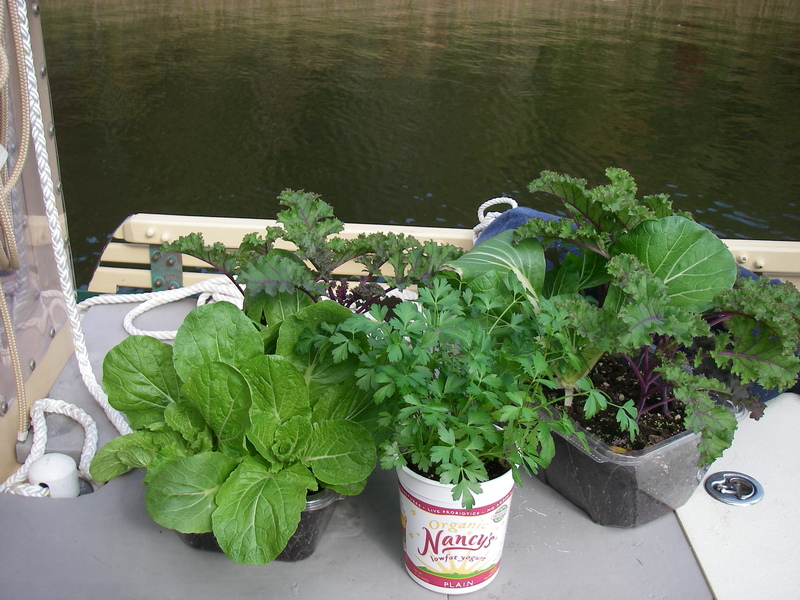 In past years, with the boat and myself getting on the water in the spring, we took advantage of already planted bowls of lettuce that were available at the co-op. The first year these grew extremely well, and then the next year not so much. I think the varied results were probably also a soil mix issue, as they weren’t treated differently otherwise. Also worth noting in the picture on the dock are the outer trays that the containers of soil are placed in. These are plastic packages from buying baby greens at the store, top and bottom from one package. Holes are poked in the container that actually has the soil, with the outer tray (the inverted package lid) catching anything that drains after watering. 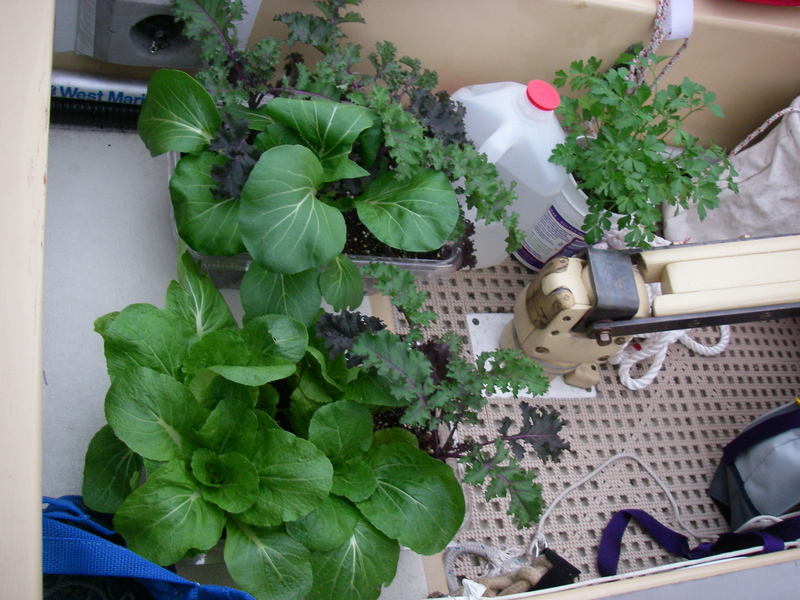 Once moved onto the boat, the outer trays aren’t so helpful as trays, because if it rains outside the plants could be swamped. But here’s the tricky thing: if the containers have just been filled with soil and planted, quite a few soil crumbs are going to come out through those drainage holes, even though the holes aren’t very big. It makes a mess. The outer trays can prevent the dirt in the cockpit, but then there is the soggy over-watering in the rain issue. It turns out that after the containers have been set up and the soil and plants have settled in for a week or two, dirt no longer falls out of those holes in the bottom, even without a tray. This is great news when it comes to moving the plants around the boat, and everything works out fine. It’s just important to get the plants going in their containers ahead of time, on a surface that allows drainage and has room for the errant soil bits to fall out, before the containers take up residence in the cockpit. It’s not the end of the world if you don’t do it that way – just messy for a while. On the cockpit sole, we have that stuff called dri-deck (as always, I’m not receiving anything for mentioning this). This is available from boat catalogs, in 12 inch squares. It helps protect the wood, where things like water jugs are left for a while, preventing consistent wet spots. It’s also great for allowing drainage through the plant containers. 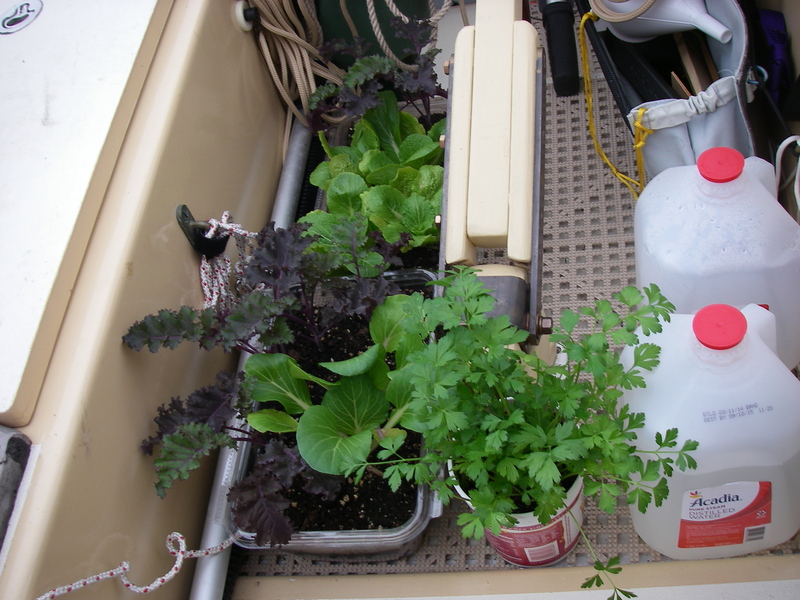 I usually water the plants while they are on the dri-deck, and don’t even worry about overflow, which takes care of itself by draining down and off the back of the boat, or by drying in place. The parsley, at the upper right in that same photo, does well in a quart yogurt container, and moves inside to the special plant racks for sailing. The main container has drainage holes, and sets inside a second container with no holes when indoors. Parsley is very sensitive to salt spray, but adapts to the indoor location easily. Lettuce in previous years has also been very sensitive to salt spray, tending to get brown spots from even very fine salt mist, just like the parsley. A wonderful surprise this year has been that both pak choy and Chinese cabbage don’t seem to care much at all about little bits of salt on their leaves, staying green and healthy. That’s buckwheat in the other two containers, which makes a nice treat, picking a number of sprigs every few days. Sunflower sprouts, which in the past have been very successful earlier in the season, declined to do much of anything at all this time around. For the future, here in New England, I’m not going to try sunflower planting after the end of August. Buckwheat, on the other hand, does just fine with the shorter days and cool temperatures. As described in a previous farm post, all of these indoor sprouts are planted in about an inch of soil. At the right season for the particular plant they do quite well, and require a lot less water than regular sprouts rinsed in a jar. 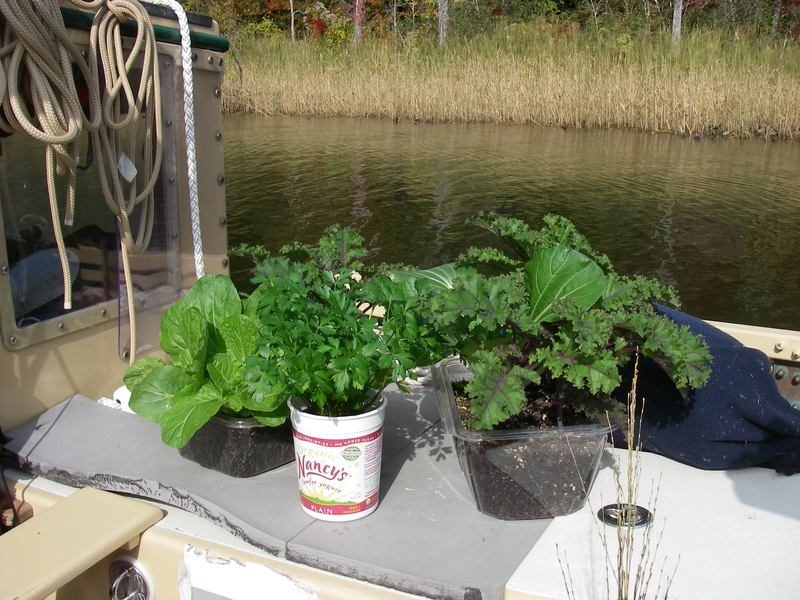 All in all, it was a good year for the boat farm, providing fresh green vegetables long after the ice jug had melted and the cooler was retired for the duration of the trip. It was a treat! Hi Shemaya! I just received my Gardens Alive catalog and thought of you when I saw more than a dozen different types of “micro-greens.” Also, they have “grow tubs,” with handles like tote bags, from 4″x4″ to gigantic, and all sorts of veggies bred for container gardening. Nearly every catalog I receive has a coupon on the front for $25 off a $50+ order (by mail, phone or online at GardensAlive.com), and the catalog itself is quite informative. No, I receive nothing for mentioning their catalog, but I’ve been a long-time satisfied customer. My gardening these days is limited to a couple of large pots, one of which just broke, so right now I’m thinking about those grow tubs! That all sounds good! (Except for the broken pot :-) Especially seeds that like to grow in containers. And I’ll have some fun looking at the special tubs. 2 feet of snow on the ground just now, but you know it’s going to change sometime!